Use the MP 4055 Black and White Laser Multifunction Printer (MFP) and make the most of a busy workday. 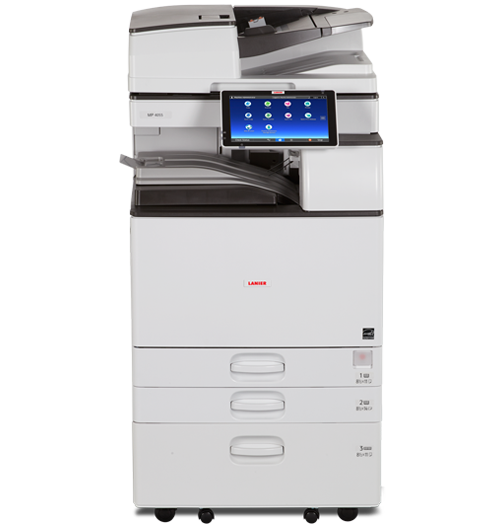 Print, copy, scan and fax (optional) with speed and convenience using customizable controls, automated workflows and mobile capabilities. Choose from automated finishing options. Add security and eco-friendly features to help reduce risks and costs. Eliminate outsourcing. The optional internal Multi-Fold Unit offers multiple types of folds, including z-, v- and tri-folding, to enhance direct mail, presentations, menus and more. Take your pick from five other finishers, including an optional 1,000-Sheet Hybrid Staple Stapleless Finisher that can create document sets with or without staples, depending on the number of pages. Create your own automated shortcuts with downloadable workflow apps — such as Conference Concierge and Scan to Me — from the Application Site. Place them directly on the Home Screen for one-touch access to faster, easier workflows. Expand paper capacity up to 4,700 sheets with optional paper sources to minimize interruptions. Store and retrieve up to 3,000 documents instantly with the Document Server. Add optional Optical Character Recognition (OCR) on every PDF file, so you can search for it quickly via keywords. Add software such as Streamline NX® and GlobalScan™ NX to expedite workflows and reduce repetitive steps.